On occasion, the old-timers left behind very valuable gold ores. They most likely had plans to further process it and refine out the gold. For one reason or another, they left it behind. If you’re lucky, you might just be able to re-discover it. It might seem strange that a miner would work so hard to tunnel into hard rock, remove valuable gold ore, and then simply leave it behind. There were times that this exact thing happened though. Let’s think about the conditions that miners were dealing with. Most early mining in the western U.S. was during the 1850s to the 1870s. This was a wild time. There were few roads or trails. Even fewer rail lines. No airplanes. The miner keeps digging into the mountain. He continues to remove valuable ore, but the mine is deep in the wilderness. It’s much too far to bring it into town for processing right now. So he piles it up and stockpiles it. Once he gets a nice pile of ore, he will transport it into town. So now the miner has a nice pile of rich ore sitting outside the entrance of his gold mine. Now it’s time to cash in on some of this gold that he’s been mining, so he decides to load up a cart pulled by horses and transport the ore into town. The reality of just how much that ore weighs sinks in. Gold is priced at $19 per troy ounce, and even a high-grade ore may take a few tons to produce once ounce of gold. The miner takes his ore into town. It needs to be crushed and processed, but he doesn’t have a stamp mill so he contracts the work to a nearby mine that has gold. They charge him a hefty fee to do this. Let’s say that the miner takes 5 tons (10,000 pounds!) of ore to a nearby mine. They crush it and get 3 ounces of gold out of it. (By any standards this would be VERY high-grade gold ore). At $19 per ounce, those 3 ounces of gold are worth $57. Except the gold isn’t 24k. So it’s actually only worth about $50. The mine with the stamp mill charges the miner $25 for stamping his ore. Now he’s down to just $25. Then he has to ride into town, perhaps several days ride, to turn his gold into cash. He spends several days and some serious hard work to make that $25. There’s still a pile of ore sitting there up on the mountain. The miner never returns for it, and it still sits there today. There is a reason why most miners that came to the goldfields of California left within the first few months. The reality of mining is that running a profitable operation is extremely difficult. The high cost of mining has always been a challenge. There are some things that are easier today such as roads access and our ability to transport ore, but it is still expensive and time consuming to get that ore out of the ground. This is one of the reasons why there are very few active hard rock gold mining operations these days. So how valuable is that Ore now? Can you make it Profitable? 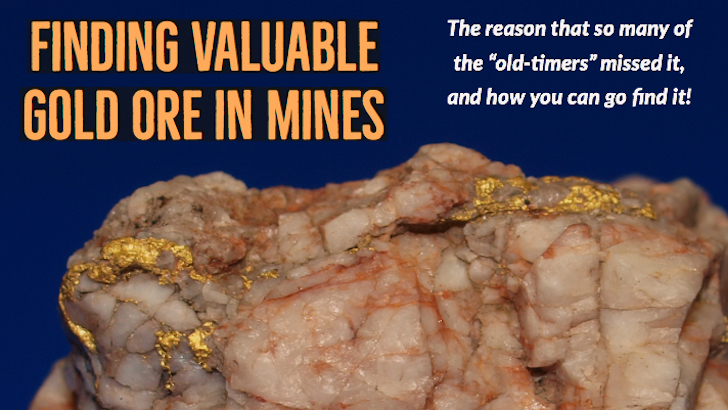 The cost of mining is still high today, but some things are very different. Gold is worth a lot more that $19 per ounce right now. With a gold price over $1000 you might be able to make it work. Plus if you find a pile of high grade gold ore that was never processed, then the hard work is already done! One of the biggest advantages that we have today is transportation. If you can easily load up the back of your truck with ore, bring it home and crush it in your garage, then pan out the heavies to get the gold then it’s a heck of a lot easier than the old-timers had it! The other awesome tool that we have is metal detectors. What an invention! The old timers sure didn’t have a tool like this! With a metal detector you can separate out the richest pieces of ore and identify only pieces that have large detectable pieces of gold in them. There is no better metal detector for this than the Fisher Gold Bug 2 . It is super sensitive to small gold. There are some extremely successful gold prospectors who use metal detectors to scan the ore piles of old gold mines for only select pieces of high grade ore. They don’t even bother with crushing or processing rock. They are only seeking out the pieces that have visible gold. Now you can see how it’s not so far-fetched that a miner might have left some very rich ore up on the mountain and never bothered to get it crushed or processed. The challenges and cost often made it so hard to turn a profit even if the ore was very rich. Fortunately, the combination of higher gold prices, lower transportation costs, and good quality metal detectors makes it very possible for a gold prospector to make money by seeking out the high grade gold sources. Rich ore is still out there at some of the old mines. You might be surprised how much gold there is left be found if you find the right places to look.